If you had Infosys Technologies on your mind, you are right! According to the survey conducted by Wall Street Journal on Top 200 most admired companies in Asia, Infosys Technologies has been named the most Admired company in India. Infosys Technologies is adjudged as the most admired company in India followed by TCS and Bharti Airtel in 2 and 3rd position respectively. The ranking has broadly taken 5 different aspects into consideration. With the biggest reserves and deposits than any other bank in India, SBI takes the numero Uno position when it comes to Financial Reputation. Reliance Industries, followed by HDFC bank complete the top 3 positions. 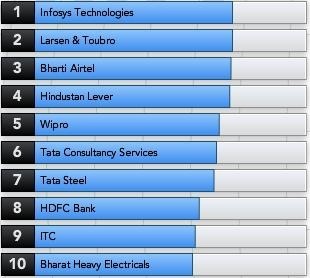 Again with excellent quality of Software deliveries, Infosys takes the top position, followed by L&T and Bharti Airtel. 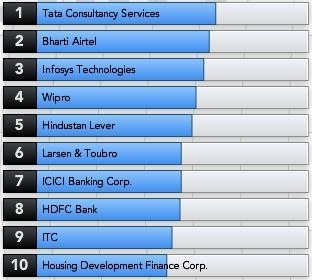 Now this is a big surprise to me, TCS takes in the top position in Innovation. I always related TCS as a Volume player without much innovation, but I seem to be completely wrong here. With visionaries like Narayan Murthy and Nandan Nilekani at the helm, Infosys Technologies had to take the top position when it comes to vision. Tata Steel surprisingly (at least for me) comes at 2nd followed by Reliance Industries. a good overview of the indian comps. Very nice statistics! It’s interesting to see where this will all take us in a few more years. 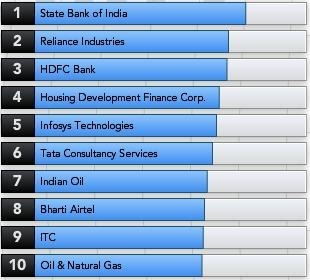 I am shocked why Reliance is not in the top 10 List! HDFC Bank done well in past two years. glad to be part of India’s most admired company – Infosys. I joined just this month in Infosys BPO Limited based here in Philippines. I’ve been through many centers already but Infosys is the only company where I got most inspired. hi this is nagma here i am really inspire of your listing the top 10 most admired companies in india. 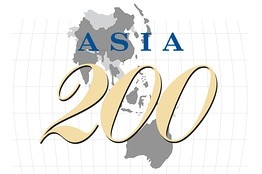 It’s really help us to get the information about the position of our country. Okay….but what about Satyam? Nonetheless, it was ravaged in the corporate sector but it there was a time when it impacted a lot on the fiscal arena of India. No doubt Infosys is most admired company in India, but I am not sure about SBI. I will not rate good for SBI and don’t think others have different opinion than this. 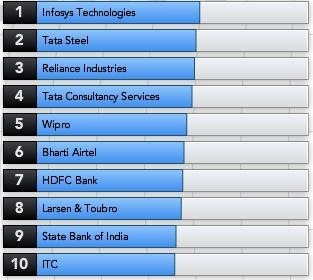 Thanks for bringing out the top ten Indian companies under different scenerios. I expected your own asseessment as A SUMMARY LISTING THE TOP TEN BEST COMPANIES TO INVEST IN. You can still make such a recommendation in your next report. 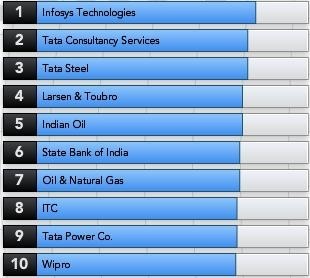 Its very plessure to see the Infosys in the top 10 list, The man who started his business with two computers and established worldwide.. Hats off Mr.Narayanamurthy.. I am little unclear about the method that they have followed to come up with this listing. The Seletion methodology has not enough. Which atleast to me seems correct !! Good news for country as companies are leading and also comes under top 10 admired companies.Best wishes 4 future………….. I Proud to be a TCSer. hello mam can u tell me why tcs is recruiting in such a figure? well can u tell me whether i m in the right path? Those charts do a lot of help for us…. At least these companies are in list at the time of recession where all it companies are down.